The Johnston-Hatcher Co. sold home furnishings of all kinds from 1899 to 1949 in downtown Springfield. The store, however, fell victim to two of the city’s most devastating early 20th-century fires. Johnston-Hatcher was the creation of two sets of brothers – Archibald (1874-1919) and J.C. Johnston (1871-1947) and Oliver (1877-1947) and Robert Hatcher Sr. (1871-1934). 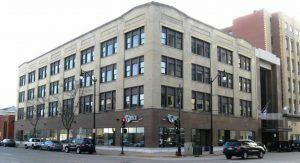 The men first partnered in business in Colfax, Ill., but moved to Springfield in 1899 to take over the failed Griswold Department Store in the 800 block of East Adams Street. A few years later, the partners built a new store at 628-30 E. Adams St., the southwest corner of Seventh and Adams streets. 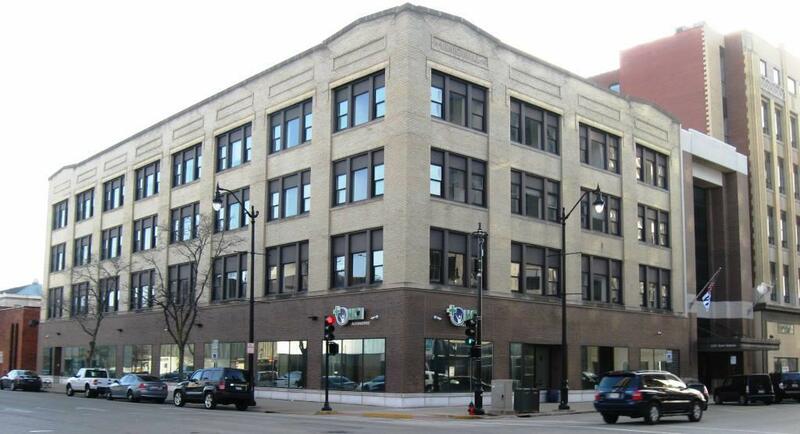 The Illinois State Register outlined Johnston-Hatcher’s offerings when the elaborate “pressed brick and plate glass” building opened in October 1905. On the first floor, the carpet, rug and drapery departments are situated, and in charge of them are: R.E. Hatcher, Albert Carswell, Tom Posey and Miss Nuckel. On the second floor, where the large furniture department is situated, J.C. Johnston and Mr. Raimes presided over the stock. The third floor accommodates the stove, range, sewing machine, china and wall paper departments, an extensive line of each, and in charge of these were Messrs. O.W. Hatcher, Paul Kerst, Harry Haley and Miss Cypher; of the wall paper department, O.B. Caldwell and Miss May Bretz. It was on this floor also that the souvenirs were given to the visitors. On the fourth floor one of the finest lines of vehicles, buggies, carriages, phaetons, etc., can be seen. This line of stock is almost entirely new and has been selected with the greatest of care. The “souvenirs” mentioned above were white, green and amber chrysanthemum vases. Five thousand were given away on opening day, one to each visitor. On Dec. 21, 1907, however, a fire that started in the Johnston-Hatcher building destroyed the eastern half of the 600 block of East Adams Street, stopping only when the blaze hit the Bressmer building, which was built to be fireproof (although Bressmer’s itself was wrecked by a fire 40 years later). 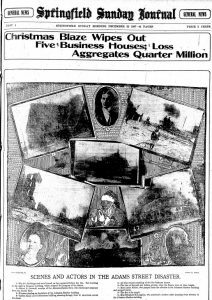 The final damage estimate, over $137,000, made the 1907 Johnston-Hatcher blaze the most expensive in Springfield history up to that time. A total of five buildings on the south side of Adams – housing another furniture outlet, a men’s clothing store, a shoe store and a restaurant – were demolished by the blaze. Two hotels, a bookstore and other businesses were damaged along Seventh Street, and heat and smoke broke windows and caused other damage on the north side of Adams. The fire apparently started below a window where Johnston-Hatcher’s Santa Claus, James Goetz (1887-1938), talked to children via a speaking tube to the outside. That led to a rumor that Goetz had started the fire when he lit his pipe. The Springfield Sunday Journal even included a drawing of a pipe-smoking Santa as a centerpiece of the nine-photograph fire collage that took up all of the paper’s front page. However, Goetz said he had neither a pipe nor matches in the window, and officials said it appeared that a short-circuit in wiring beneath the window ignited the cotton “snow” in Goetz’s display window, the Illinois State Register reported. So sudden was the early spread of the flames the entire Johnston-Hatcher building was gone before the news of the fire had spread. Like a flash the fire worked its way from floor to floor and darted heavenward from windows and doors, converting the building into one vast furnace, defying the firemen and meaning destruction inevitable. It was one of the most sensationally spectacular fires ever witnessed in Springfield. It sets a new record. No one died in the fire, although at least 10 people were injured, most when they jumped from a malfunctioning freight elevator or from windows and fire escapes. After the 1907 blaze, Johnston-Hatcher moved temporarily to East Monroe Street while rebuilding was under way at Seventh and Adams. The new building nearly doubled the store’s square footage, although one major change was that iron girders were installed in the new building instead of wood. Johnston-Hatcher moved into the new structure in October 1908. Much of the store’s inventory was damaged by smoke and water when O.B. Caldwell’s wallpaper store next door caught fire in September 1910. 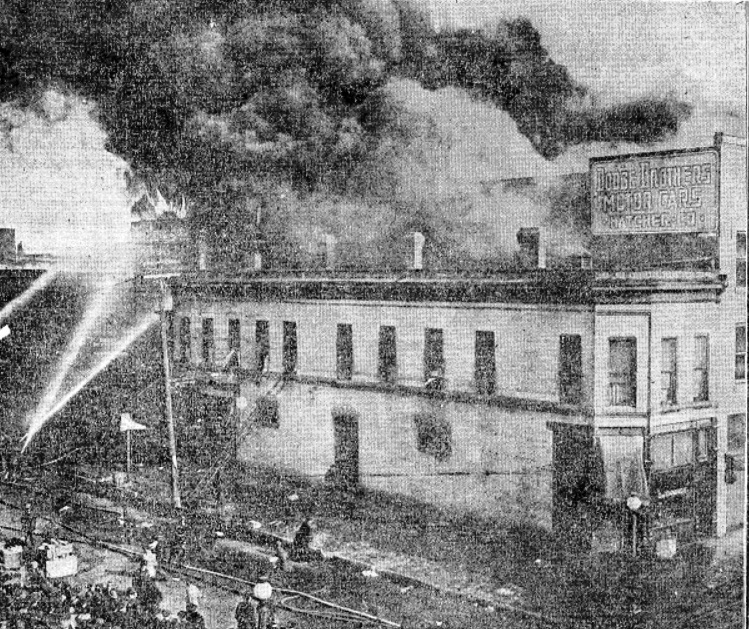 Even then, the Register noted, “The scene of yesterday’s fire … is not a new one for the firemen.” The story cited not only the 1907 Johnston-Hatcher blaze but also a fire in another furniture store the month before and one at an implement store in 1908; “the Bartel building, near the Johnston-Hatcher building, has been destroyed three times,” the Register said. Firefighters were back at Seventh and Adams on Oct. 11, 1913, when another spectacular fire demolished the new Johnston-Hatcher building. Once again, flames then swept west along the same half block of Adams Street. 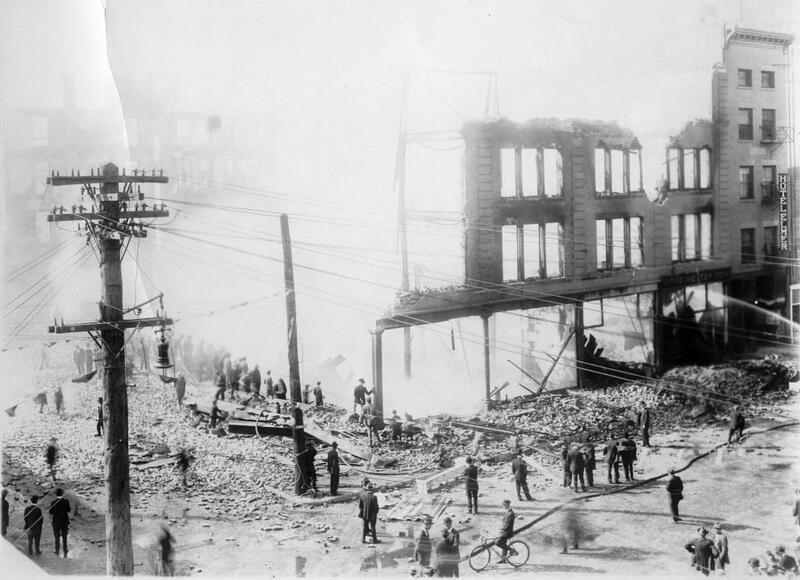 Although a firewall at 622 E. Adams slowed the blaze, the fire didn’t come to a complete halt until it reached the stalwart walls of the Bressmer building. Visitors in town for the Illinois State Fair (then held in the fall) quickly evacuated the Collins House on Seventh Street and the Hotel Elmer at 622½ E. Adams. The Register described the scene the next day. The smouldering mass of wreckage attracted thousands of spectators yesterday. Fire ropes were stretched in Seventh street, from Adams to Washington, and in Adams street from Sixth to Seventh streets. The crowd became so large in the afternoon that an extra detail of policemen was necessary to keep the crowd out of harm’s way. Details of firemen worked spells from 7 o’clock in the morning until dusk in an effort to cool the mass of ruins, to allow workmen to dig for safes and other valuable articles which fell into the basement when the floors gave way. Twisted masses of steel girders and remnants of walls alone remained to represent the business blocks. Johnston-Hatcher moved temporarily again, back to its old store and warehouse at 819-21 E. Adams, and began rebuilding again at Seventh and Adams. This time, the company reached agreement with the property owner, Mary Mendenhall, to build a four-story structure with 40 feet of frontage on Adams and 157 feet on Seventh Street. Total square footage was only about half that of Johnston-Hatcher’s previous store, the Journal reported in December 1914, but Julius Myers reached agreement with Mendenhall to simultaneously construct an adjoining building. The resulting Mendenhall-Myers structure took up half of the 600 block of East Adams and half of the 200 block of South Seventh Street. The construction is semi-fireproof, steel-skeleton, mill-construction, with metal lath throughout, which, along with a complete modern sprinkler system, and sheet metal wire glass windows in all walls next to adjoining buildings, all as approved by the laboratories of the National Board of Underwriters of Chicago, practically insures this building from destruction by fire. In this sprinkler system there is a constant potential storage of 36,000 gallons of water in the tanks on the pent house, and over 350 automatic sprinkler outlets which operate automatically upon being subjected to a heat of 150 degrees F. And when any one of these outlets is opened the floor is sprinkled for a radius of five feet and the general fire alarm automatically given. The elevator and stairways are in enclosed shafts built independently (sic), as near as possible, of the main structural parts of the building, with the intent that they may be in commission during a fire. The principal danger from fire in a building of this type is a local fire on one floor, in which event, in this building, the people could be taken from the stories above safely right through the fire zone. The precautions worked. The only instance in which the sprinklers were needed, according to newspaper records, took place in 1942, when water from the system extinguished a fire that burnt a dozen mattresses on the building’s fourth floor. Johnston-Hatcher Co. closed in 1949, but the Mendenhall-Myers building still stood in 2017. The Hatcher family, however, wasn’t done with fires. Perhaps as an outgrowth of Johnston-Hatcher’s trade in buggies and carriages, Oliver and Robert Hatcher Sr., later joined by Robert Jr., began a separate automobile sales business in 1905. Eventually, the Hatchers handed off the home furnishings business to J.C. Johnston and devoted themselves to auto sales and service. Starting in about 1915, they created Springfield’s first Dodge and Studebaker outlets, which soon became the largest anywhere in Illinois outside Chicago. The Hatcher company has grown from a small business where the owners were the entire organization to a business employing about 150 people and today do more business annually than any other concern in Springfield with the exception of one manufacturing plant. This will be news to many and it will also give an insight into the tremendous growth of the once small company. The building had an elevator shaft that could lift two cars at a time from the first floor to the third. On Jan. 19, 1921, a gas tank exploded in the first-floor service station, flames shot up the elevator and air shafts, and 13 third-floor employees had to jump to the ground to save their lives. (One of the escapees was Johnston-Hatcher’s 1907 Santa Claus, James Goetz, who worked as a mechanic for the Hatcher auto dealership.) Remarkably, none of the workers were seriously injured by their falls, although one was badly burned. The fire destroyed the 1920 building, along with 50 automobiles, most of which had been brought in for service. The Hatchers replaced the burned building with a smaller service facility and car wash. This entry was posted in Agriculture, Airport, Amusements, Auto dealers, Buildings, Business, Crime and vice, Disasters, Farming, Fires, Presidents, Prominent figures, Uncategorized. Bookmark the permalink. Does the company still exist today? I have a piece of beautiful furniture from them. I’m trying to gain more history on it. It’s a lovely armoire. Ms. Wojcik: No, I’m sorry, it’s long gone.